A beloved pup has been reunited with his family after going missing following a fatal car crash. Caesar, a Maltese, was taken back to his owner Monica Benson, following a 1,500 mile round trip which began with the crash in New Mexico on June 15, 2010. 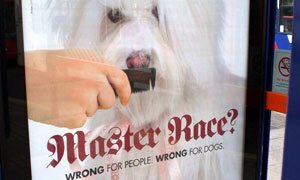 The poster was meant to target dog breeders by suggesting that the ‘breed standards’ adopted by Crufts and the Kennel Club were to the detriment of all dogs. The idea is that you should adopt rescue dogs rather than trying to seek out one organisation’s ideology of a master race. That’s just what Peta thought. However, when the poster was displayed around Birmingham in the run up to the Crufts show it caused quite a stir, and generated a few complaints. It wasn’t too long ago we reported that Elle Macpherson’s dog signed a modelling contract, taking the Labradoodle Bella to instant stardom, and talked about the world’s richest dogs, so here we take a look at the top 7 world’s most famous dogs. Top of the list at the moment, according to the Telegraph, is Obama’s dog Bo. We reported every step of Bo’s journey from when Bo was returned to his breeder to his welcoming as First Dog Bo. 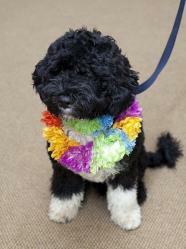 Bo’s addition to the Obama family has rocketed the Portuguese water dog breed to instant fame worldwide. Ashley and Cheryl Cole – who gets the dogs? It wasn’t that long ago that we published an article on Tilly, the 15 inch little dog that may become Britain’s smallest dog. However, now we might be looking at a new contender for the world’s smallest dog – so meet Scooter, a Maltese puppy whose owner believes may be the world’s smallest dog, if he’s stopped growing that is. On Tuesday this week, it was announced that $136 million of late New York property and hotel billionaire Leona Helmsley’s estated would be given to charity, but it was disappointing to hear that just $1 million will be distributed to dog-related charities that she preferred. Helmsley died aged 87 in 2007 at her home in Connecticut, leaving instructions to the trustees of her estate that most of her multi-billions should go towards the care and welfare of dogs. However, the will also gave the trustees discretion in distributing the funding. Who is the richest dog in the world? The Maltese dog breed (pronounced Mall-teez) is a lively, intelligent and playful breed. It is not as common in the UK as other long haired breeds, such as the shih tzu or the llasa apso, but nonetheless, has grown in popularity since its first introduction to the UK. 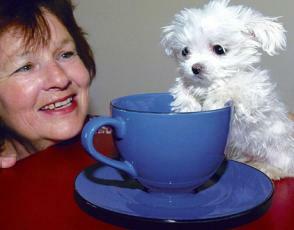 It is said that nobody ever ‘owns’ a Maltese, but rather this regal little dog owns the owner. Its pure white coat, when grown to its fullest, adds to its glamorous appearance but even when cut short this little dog retains its regality. When purchasing a Maltese, it is not uncommon to see breeder’s advertisements stating ‘tiny’ or ‘toy Maltese’, ‘miniature Maltese’ or other such names that may imply a smaller and cuter Maltese but these should be ignored. Like any other breed, there are smaller and larger forms of the breed but they are no different to any other Maltese in any way.